The Anna Burgin series features Anna – a fashion photographer – and her flatmate Danny, who works as an investigative journalist on a big tabloid newspaper. There’s murder, mayhem, and lots of cups of tea – together with a dash of 1990s nostalgia. Cold Press is the official first of the series, but In The Frame is an introductory novella that’s available as free download when you join the mailing list, showing how they got together and how they solve their first case. 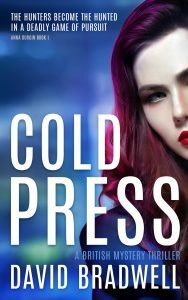 Packed with intrigue, twists, conspiracies and dark humour, Cold Press is a hugely entertaining mystery set in 1993. Clare Woodbrook is the enigmatic head of the Special Investigations Department at Britain’s leading daily tabloid. Her exposés are legendary, but she’s not without her enemies. Now, on the verge of unveiling her biggest-ever scoop, she arranges to meet her researcher Danny Churchill, to reveal all over lunch. But Clare never shows, and later that day her car is found abandoned on the hard shoulder of the M25. Worse still, the enquiry is being headed up by DCI Graham March – the embodiment of police corruption, and the subject of one of Clare’s current investigations. Danny sets out to find Clare, and enlists the help of his friend and flatmate – fashion photographer Anna Burgin. 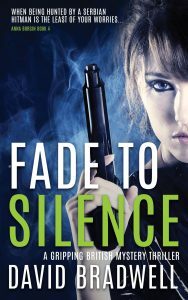 But as they embark upon an explosive trail of murder and intrigue, they realise they are not alone in trying to find Clare. And soon their own lives are very much on the line. It’s 1994 and investigative journalist Danny Churchill is hot on the trail of Graham March – the disgraced former police DCI. The investigation takes him to Germany where he soon starts to uncover dark secrets and new depths of depravity. Back in London, and aided by his flatmate – fashion photographer Anna Burgin – Danny’s investigation intensifies, but as he gets closer to the truth, the body count starts to rise. Help is offered from the most unlikely of sources, but if Danny accepts, is he doing a deal with the devil herself? 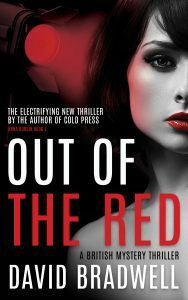 Packed with twists and dark humour, Out Of the Red is book two in the Anna Burgin series and the sequel to Cold Press – the Amazon top 10 bestseller. 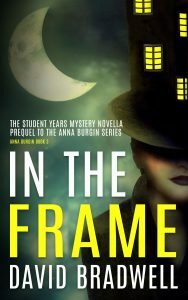 In The Frame is the novella prequel to the Anna Burgin series of mystery thrillers, and introduces Anna and journalist Danny Churchill at college in 1989. Photography student Anna Burgin didn’t expect to be arrested, but she’s the only suspect for a series of crimes, and the Police have found damning evidence in her room. But Anna has no recollection of doing anything wrong. Was it a moment of madness? Or is somebody setting out to destroy her? And is the stranger in the bar really trying to help, or just part of an evil conspiracy?